Joan received the OGC's Gardel award during the OGC Technical Committee Meeting dinner in Stuttgart, Germany on the 13th of September. 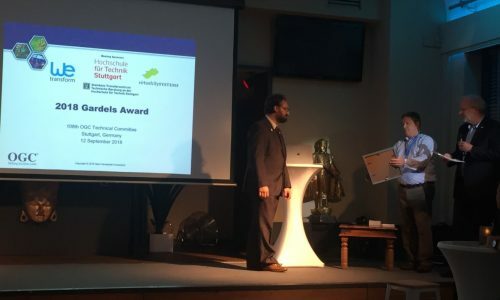 The Kenneth D. Gardels award is a golden medal presented each year by the Board of Directors of the Open Geospatial Consortium, Inc. (OGC) to an individual who has made exemplary contributions to advancing OGC’s vision of fully integrating geospatial information into the world’s information systems. Joan Masó, from CREAF and member of Ground Truth 2.0, was awarded for being ‘the hardest working OGC member out there’. Joan chairs several working groups including the Citizen Science Group and the Non Authoritative Data Ad-hog group in the Standards program, and it is also active in the OGC Innovation Program where he participated in several Testbeds and now chairs the Citizen Science Interoperability Experiment where Ground Truth 2.0 participates. His work on the Web Map Tile Service (WMTS) standard has proved invaluable, as this standard is one of the most widely adopted standards in the geospatial community. In addition to chairing several Working Groups, Joan was elected by the OGC membership to become a member of the OGC Architecture Board (OAB), in order to ensure that OGC standards remain of the high quality and inter-operable consistency as desired by the membership. OAB duties also include assessing emerging trends in technology and business practices to assist in aligning OGC efforts with the direction in which the industry is moving. Joan Masó and his team are constantly promoting geospatial standards to help disseminate Citizen Science data and connect it to GEOSS. Moreover, the team researches on how data quality and how it can be better communicated, and how the Citizen Observatories and case studies in Ground Truth 2.0 can gain the trust of decision makers. Mark Reichardt, President and CEO of OGC, commented: “Each year, one member representative of the Consortium is acknowledged by his or her peers and the OGC Board of Directors for their personal excellence, unwavering commitment, and substantial contributions to the OGC mission. Congratulations to Joan Masó on his selection for this award. Kenn would be proud.” In response, Joan Masó declared: “The fact that the award is given to me this year demonstrates to what extent the OGC values people who make small contributions towards standardization in a constant way along the years, without having to solve a big problem in a moment of geniality. Within the OGC, everyone can find their space, if they are willing to work generously. One challenge ahead is to be able to produce the new generation of web services based on OpenAPI and that is way I should continue helping from the Architecture Group and the OWS Common Groups”. The Gardels Award was conceived to memorialize the spirit of a man who dreamt passionately of making the world a better place through open communication and the use of information technology to improve the quality of human life. 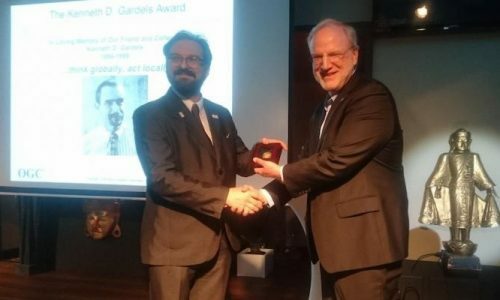 Kenneth Gardels is remembered for his principles, courage, and humility, and for his accomplishments in promoting spatial technologies as tools for preserving the environment and serving human needs.